We have monthly talks on a Thursday evening from September to April, and more informal meetings of the Family History Group monthly from September to June. Go to the What’s On page for full details of the current programme. Many people with a local family connection are members of our Family History Group, although anyone is welcome to join. Even if there is no family connection, local residents with an interest in the history of their house and the people who lived there also take part in research and activities. We have a varied programme of talks and we exchange information and ideas for research. If you have a story to contribute or a query about your family’s history, do get in touch. 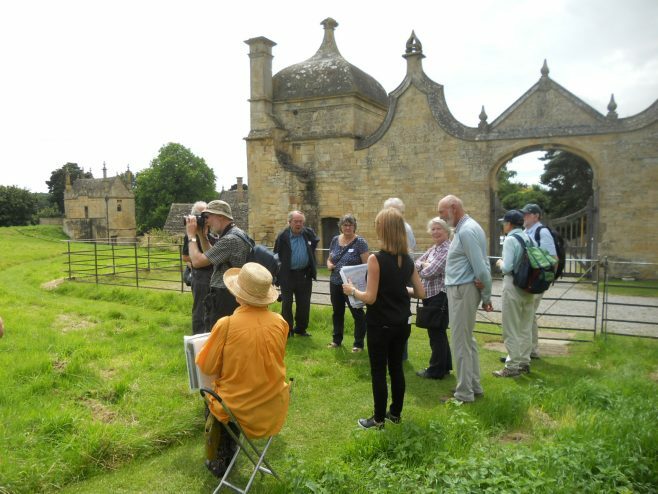 Usually two outings a year are organised to places of historical interest and other events are planned to promote particular activities. In 2017, the outings have been to great houses built in the Jacobean period, as part of our Campden House research project. We visited Aston Hall in April after our second archaeological dig, and found many clues about how our house might have looked. Then in July we travelled to Hatfield House, built by Robert Cecil Earl of Salisbury, friend to the Hicks family, at just the time that Baptist Hicks was planning his house in Campden. For information about our current projects go to the Projects page.